Kazuma runs the martial arts dojo in the Sohma family and teaches many members of the zodiac how to fight. He's the adoptive father of Kyo and Kyo affectionately calls him "shishou," an old term for master that no one else really uses when referring to Kazuma. We first learn about Kazuma when Kyo tells Tohru about his martial arts master, enthusiastically telling her how strong he is and how he looks forward to his next training session. We don't actually meet Kazuma until he returns from a training trip and comes to visit Kyo at Shigure's home. Kyo is absolutely ecstatic to see him! The first thing Kazuma notices is how Kyo seems to smile more often when he's around Tohru. This is a stark contrast to how he last saw Kyo; a depressed young man holding onto a lot of hatred. Tohru learns that Kazuma's grandfather was also possessed by the cat and that he witnessed first-hand the cruelty the cat endures. Kyo leaves the room because he doesn't want anyone to see how excited he is to see Kazuma and when they are alone, Kyo tells him that he wants to move back to the dojo. Kazuma tells him he should stay at Shigure's because it's good for him. Kyo says he hates it there but Kazuma recognizes that's not really the case. 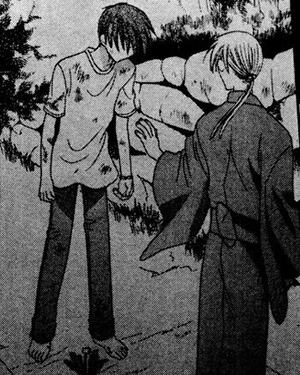 He feels like if he stays there, Tohru may cure Kyo's pain. Kazuma decides that he will take a risk by exposing Tohru to Kyo's true form and see if she will accept him. He asks Tohru to meet him outside in the evening and separately asks the same of Kyo. When the time comes, Kazuma confronts Kyo and tells him that he must accept his true form if he ever hopes to move forward in life. Kyo says that he's accepted that it's Yuki's fault that he's possessed by the cat. Disappointed, Kazuma asks Kyo if he really wants to spend the rest of his life hating and ending up like his grandfather who died alone. 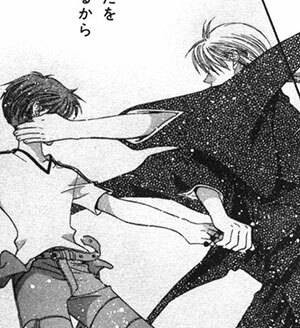 Before Kyo has any time to respond, Kazuma distracts Kyo by slapping him while he pulls his bracelet off. Just before Kyo transforms into his true form, he sees Tohru standing behind Kazuma. Kyo is mortified and runs away into the woods. Tohru, shocked at seeing Kyo transform into something so horrible, follows him anyway. All Kazuma can do is hope for the best and when Tohru returns with Kyo as a cat in her arms, he's overjoyed. The next morning, Kazuma attempts to leave without saying anything to Kyo. Tohru sees him to the end of the property and Kazuma tells her that he adopted Kyo because he felt guilty about how he treated his grandfather but over time, he developed real feelings of love for Kyo. He felt like a father and Tohru says that it feels like he is a very good one. 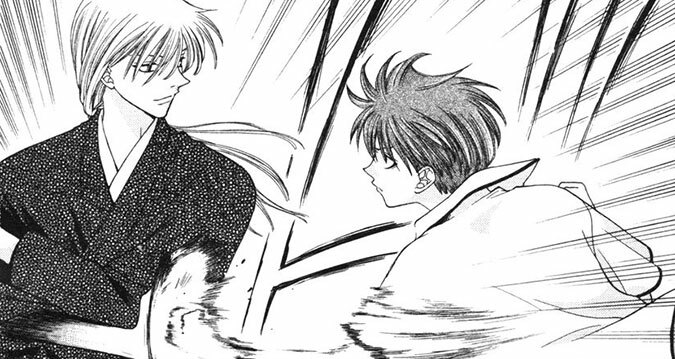 Kyo catches up to them and attacks Kazuma, saying he shouldn't leave without saying goodbye. He also tells Kazuma that, despite being a lot of trouble for him, Kyo wants to be able to get to the point where he can proudly call Kazuma his father. The next time Kyo sees Kazuma is with Tohru at the dojo. When the two arrive, they find Kazuma trying to cook for them but he's.. not very successful (he's burned their food!). Tohru offers to cook instead, much to Kazuma's approval. Kyo becomes irritated that Kazuma is making the guest cook but ends up helping Tohru in the kitchen. Tohru tells Kazuma that Kyo's a very good cook; Kazuma's surprised that Kyo has already cooked for Tohru but seems pleased by this. Kyo becomes embarrassed, naturally, and tells Kazuma to go away. As it is, Kazuma gets called by Kyo's father and tells the two that he needs to leave briefly to take care of some unpleasant business. It turns out that Kyo's father wanted to ask Kazuma for his help in ensuring that Kyo is put into confinement after graduation. Kazuma is not surprised that this is what Kyo's father wants and refuses, leaving shortly after arriving. When he returns home, lunch is ready and he happily eats with Tohru and Kyo. During summer holidays, when Kyo must visit with Akito, we learn through his flashbacks that it was Kazuma who took him on the four month training trip prior to his introduction at the beginning of the series. As the two walk along a path, Kazuma suddenly asks a depressed Kyo to stop. They look down and there is a small flower growing in the middle of the path and if Kazuma hadn't stopped Kyo, he would have crushed it. In short, Kazuma tells him that Kyo must have some hope left that someone will accept him for who he is, because he continues to live and push forward. Kyo angrily says he has nothing like hope in him and crushes the flower underfoot. Kazuma kindly tells him that no matter how much he may deny having it, the wish to be accepted will stay with him and there will be a day where it will bloom. 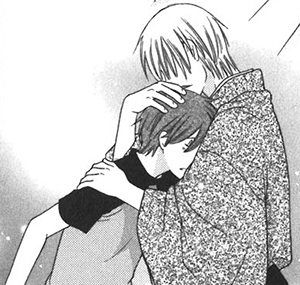 As Kyo thinks about this in present day, he realises that his hope has come back to him and he rushes to find Tohru. Eventually, time comes for students at Kaibara Public High School to consider their futures in terms of careers or continuing their education. Kazuma attends the school to talk to Kyo's teacher but the entire conversation is very uncomfortable. Both he and Kyo know that it's very likely that Kyo won't be able to do anything at all after graduation but they can't tell his teacher this and Kyo outright doesn't to talk about the future at all. He ends up leaving in a mood and Kazuma follows, telling him that no adult has the right to take away a child's future. He tells Kyo that it's okay to think about what he wants to do with his life when school is finished. Tohru and Kyo visit Kazuma to spend new year's with him. Tohru and Kazuma formally exchange new year's greetings and Kyo teases Tohru, saying it's like she's coming into the house as a new bride. XD Kazuma mentions to Kyo that they spend every new year together and asks if Kyo wouldn't like to be with Tohru instead; Kyo says it's good for the three of them to spend it together. Much later, on his way to visit Kazuma, Kyo sees Akito who tells him he's free to do what he wants. She leaves and Kazuma comes out to tell him that Akito heard that he visited his father and decided to tear down the room of the cat. Kyo is absolutely shocked to hear this; he was planning on defying his confinement but never expected Akito to actually tear the room down. Shortly after the room is destroyed, the curse is broken. Kyo and Tohru immediately go to Kazuma and Kyo shows him that he's no longer wearing the bracelet that keeps him from transforming into his true form. As Kyo explains what happens, Kazuma gets a look of shock across his face and embraces his son happily. Kyo and Tohru again visit Kazuma to tell him formally that they are a couple. Kazuma says that he has no regrets and can die happy, much to Tohru's horror. 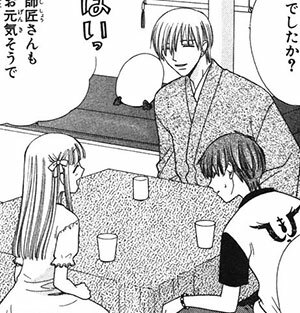 xD Kunimitsu tells Kazuma that if Kyo and Tohru married, they'd have a child and Kazuma would be a grandfather. He thinks it over and then happily tells the two that he will look forward to the future. I really believe that in adopting Kyo, Kazuma saved his life. Kyo was in a really, really bad place as a child and I think that he would have been confined to the cat's room at a much earlier age. His father seems completely unable to cope with having Kyo as a son at all and if Kyo stayed in that environment, he definitely would not have made it very far in life. Their relationship is absolutely adorable. Kyo as a child was so possessive of Kazuma that it just kills me. XD Especially when Hanajima shows interest in Kazuma romantically, the "child" in Kyo comes out.. Too cute!! Kyo still suffered a lot due to his curse as the cat but I think having Kazuma in his life really distracted him from a lot of the pain he had to deal with. Kazuma clearly loves him as a son, going out of his way to show people that he doesn't care what they think of him being the cat's adoptive father. He's such a kind person, I'm glad that Kyo is able to have him in his life.